Few things add to the beauty of a salt-water aquarium as impressively as coral but keeping coral alive and healthy can be a tricky business. Whilst some aquarists enjoy decorating their tanks with dead corals, live coral is much more attractive and can provide a better environment for your fish. Learning to look after it can be a fascinating challenge. There are two basic types of coral: hard coral and soft coral. The former build up a hard exoskeleton which can form the basis of a reef. The latter are soft-bodied, often with tentacles for catching food. It is possible to keep either or both types in an aquarium, but you must check to make sure that the individual species you choose are compatible with your fish. It's worth noting that some corals have painful stings, so take care when handling them. A few, like bubble coral, will sting and damage other coral, so must be kept alone or carefully positioned where they can do no harm. When you select coral for your aquarium, read up on each species carefully to make sure that they can thrive in the same environment. Critical to this is the balance of elements (such as iodine and calcium) which each coral requires from the water. Sometimes a balance which is good for one species can be too much for another. To keep coral in your aquarium, you'll need a suitable growth medium. Usually the most effective method is to cover the base of the tank with an inch of fine coral sand, which is easily filtered. Live rock can be placed on this to give the coral something to anchor itself to. Most coral requires a water temperature of 26ºc to 28ºc and is particularly sensitive to temperature shifts. You should make sure that there is plenty of water movement within the tank as the coral relies on currents to bring food to it and to prevent its surface from overheating. Avoid using chemical filtration, which can absorb too many of the nutrients the coral needs, and be especially careful about adding medication to the aquarium, as many fish medicines are toxic to coral. Many people make the mistake of thinking of coral as a plant. In reality, it is composed of a colony of tiny animals; and, like all animals, they need access to appropriate food. Strong lighting is essential to enable coral to thrive in your aquarium as it supports the growth of symbiotic algae whose waste products provide food for the coral. However, you should also be providing other forms of nutrition. The difficulty is in providing your corals with what they need without creating a build-up of organic matter in the aquarium which will lead to rising nitrate levels harmful to your fish. For this reason it's best to feed your corals at specific times (most prefer to eat after dark) and to use a powerful filter or protein skimmer to get rid of excess nutrients afterwards. 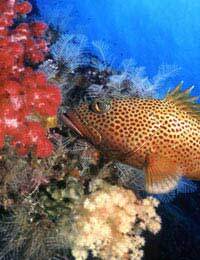 Corals in the wild eat a mixture of planktonic organisms and decaying organic matter sifted from the water. This includes algae, which should grow naturally in your tank. You can supplement this with ground up fish foods such as roe, soaked and shredded seaweeds, and puréed seafood such as mussels, clams and oysters. Feed sparingly and check the water chemistry regularly until you find a balance which suits your aquarium. Environmentalists are increasingly concerned that the aquarium and collectors' trades are contributing to the destruction of wild coral reefs. If you want to keep coral without adding to this problem, you can look out for shops selling aquacultured coral, which has been grown in aquariums. Coral aquariums are high-maintenance and require a lot of attention but can be extremely rewarding for the enthusiast. They take fish keeping a stage further and allow you to be intimately involved with the management of a beautiful ecosystem. When they are successful, they can be the highlight of your home.